We did it! We started solar cooking! Yesterday morning was our first (and hopefully not final) attempt at cooking in our solar oven. 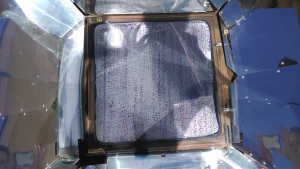 If you are new here, we have a box-style solar oven called a Sun Oven. So, yesterday morning I hauled the box out back to my south-facing porch and opened it up. It's pretty easy to unfold the reflectors and since this was my first attempt, I didn't worry too much about where the sun was pointed. I just angled it to face a little bit east of due south, and plopped in my sturdy cast iron cooking pot with lid. Apparently the lid is important in this type of cooking as otherwise the heat doesn't stay in well. Dump it all in and cook all day. That's literally what we did. 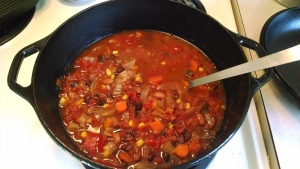 I put the chili in around 7:30, my son's preschool came over to guack at it around 9:30 am, and by then the temperature inside the oven was reading about 150 degrees F! I checked on it every few hours to see how hot it got, and it peaked at almost 300 degrees at noon (not bad since the high was only 80 yesterday outside). An hour later I found the steamiest glass cover ever. The water was beading and running down it. I had to research online if that was okay or not, but apparently this is normal with stews and such, so I just opened the glass for a second to read the temperature and then put it back. It was still reading 250, so I figured it was fine and left it till dinner around 5 pm. Our goal is to cook in our our slow cooker everyday for the next 6 months. Stop by and see how we are doing! Congratulations! I'm sure you will have many, many more days of solar cooking. Chili is one of my favorites to do in the solar cooker and we do it often.